II’ve been having a tug of war with Kotobukiya’s Marvel Bishoujo line after a jarring change of scale in the line - something that started when Black Cat was released in 1:7 Scale as opposed to the previous 1:8 Scale releases. Feeling like my collection was forever going to feel like a mismatched bunch, I contemplated giving up on the line for good. The decision that I ultimately came to is to take the smaller, earlier versions out of my display to focus on the current scale, with hopes that Koto will get around to releasing matching scale versions of the earlier characters in time – as they have now done with Black Widow. 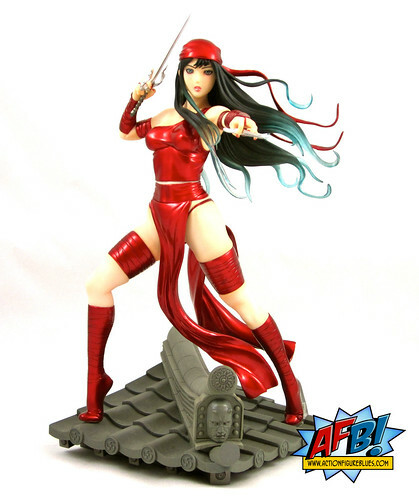 All that brings me to the Kotobukiya Marvel Bishoujo Elektra Statue, which I am reviewing tonight. This has been out for a while now, but has sat unopened while I decided what to do with this line. Now that I’m back “in” she has finally been allowed out of the box and into the AFB Photo Studio! Any reservations I might have had about keeping this piece were resolved the moment I got her out of the box. 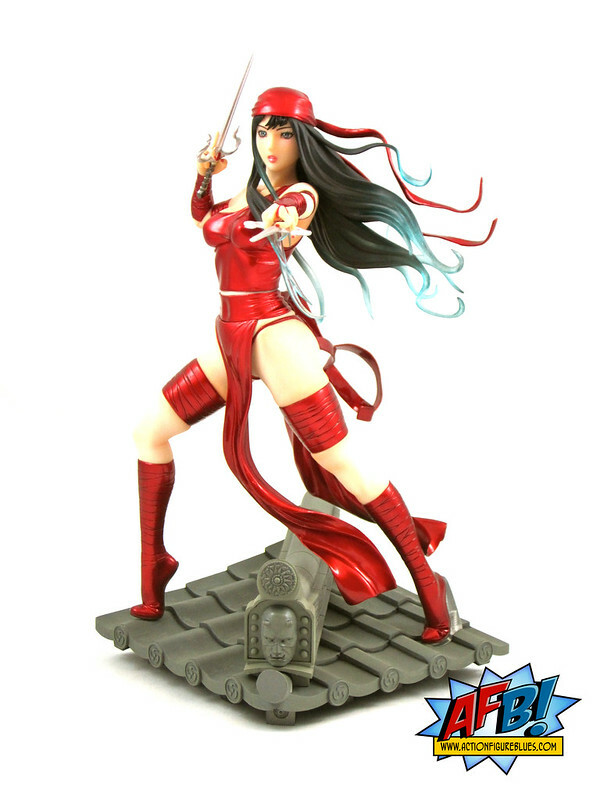 Elektra has never been a favourite character of mine, but this is one good looking statue. The usual quality sculpting I’ve come to expect from this line is present, along with the trademark flowing locks and clothing which the PVC base of these pieces allows sculptors to add without fear of breakage. 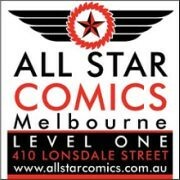 Also present is a translucent element at the end of Elektra’s hair, which has also become a signature of this line. 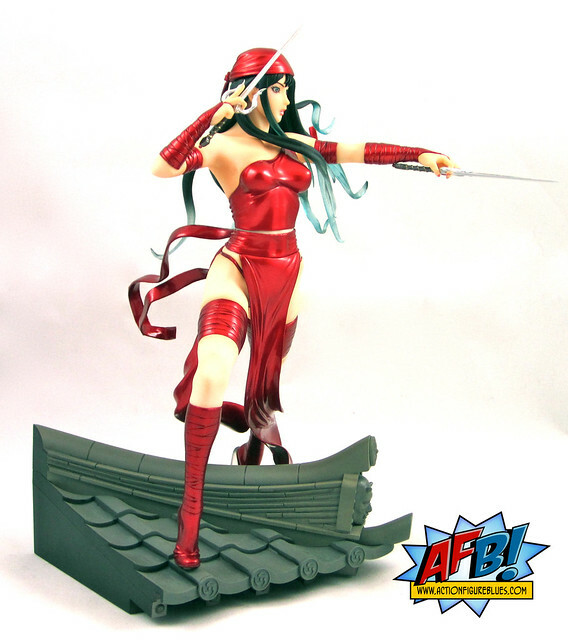 The use of a metallic red for Elektra’s outfit really makes this piece stand out, and it contrasts beautifully with her ivory skin. The paint work on this statue is very solid, although the very small line of her bare midriff that we can see looks much lighter than the rest of her skin, almost as if it is unpainted. Koto love to produce variants for these statues, and I’d be highly surprised if we don’t eventually see a white costume version of this piece. The sai that fit into Elektra’s hands are so complicated to insert that the piece actually comes with an included set of instructions. I thought this was amusing until I actually tried to set them up. It’s worth the trouble as they are very good looking once they are properly set up. One big improvement that Kotobukiya has made on this line over the years is the quality of the bases. Whereas the early pieces in the line came posed on random white shapes, most of the current statues in the line have a detailed, character specific base included. Elektra’s base looks like a section of a roof of a dojo, complete with Daredevil’s face sculpted into the roof line. It’s good fun and beautifully detailed. 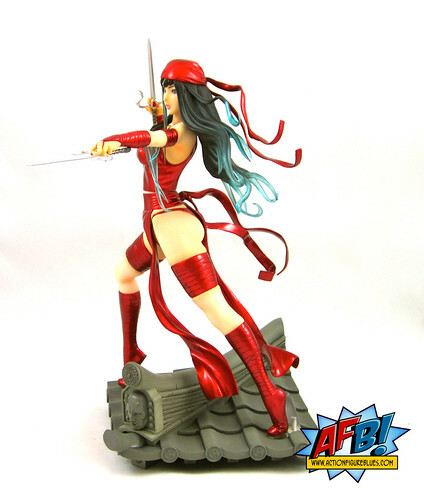 Despite the fact that Elektra doesn’t mean much to me as a character, this piece has become a favourite of mine in the Kotobukiya Marvel line simply because the detail, skill and craftsmanship that has gone in to creating it. I couldn’t think of a better “welcome back” to collecting this line!